Monday at 1:30 & 2 Committees review the measures, review what’s at stake in the pdf below. Tuesday 8/2 3pm BOS meeting, public comment requested. Potrero Hill Dem Club endorsements for State candidates & measures. SF candidate and measure endorsements will be considered in Sept. The campaign teams are well-organized and enjoyable to work with. You’ll meet campaign manager Chelsea in D1 for Sandra Fewer, Angeles in D9 for Hillary Ronen, and Gomez in D11 for Kim Alvarenga. 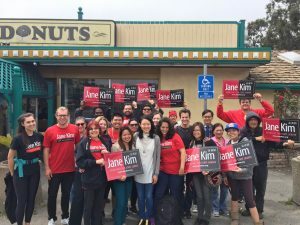 Jane Kim’s State Senate campaign is run by Charles and Davi, and often coordinates with the Supe campaigns. Get out in the field and meet the candidates and campaign staffs, all hard workers and the best sort of folks!